Joseph's life was about many hardships, failures, and injustices along with Joseph's knowledge of God, courage in prison, and his confidence that it was all meant for the Good. Joseph was a type of Jesus, and in his life the cup and persecution preceded the revelation of JESUS, the KING, the BROTHER! 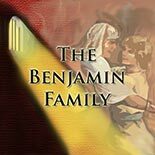 There was a shadow of bringing out Benjamin before the Older Brother revealed Himself in Glory. The dungeon is a bridge to Glory!